I am drawn to the colors of fall which you find frequently in my landscape quilts. 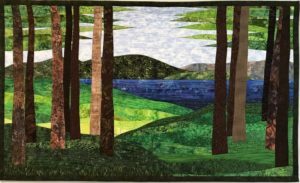 But as the summer finally arrived here in central Pennsylvania and the greens exploded around us, I decided to create several tree quilts with the beautiful greens of the summer season. In the past I’ve made several larger width custom landscape quilts for specific placement over a bed headboard or a sofa. I decided to create a quilt in the larger size of 26.5″H x 44″W. This is an easy design to make a a custom into an even larger size if you so desire. 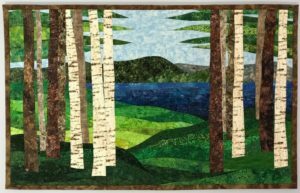 I like to create depth in landscape quilts with the use of light and dark colors. 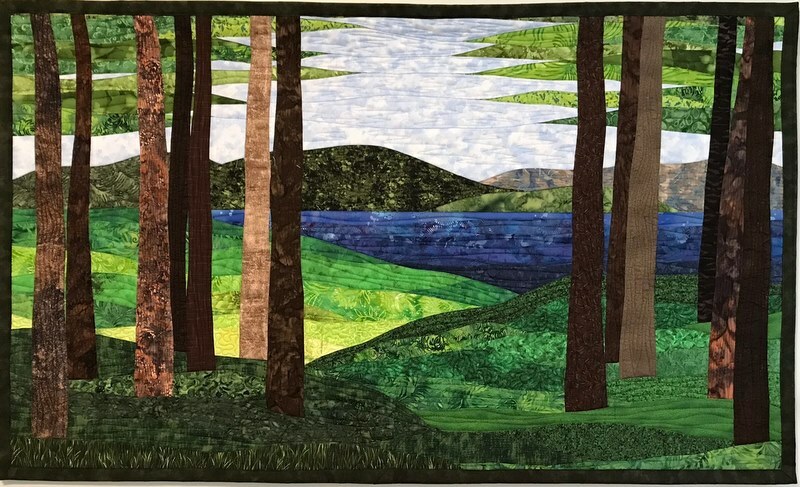 In this quilt there is definitely the darker foreground with the shady trees and then a brighter and lighter open space nearer to the lake where the sun shines unhindered. 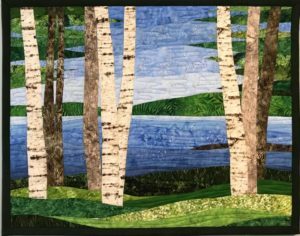 A customer loved this design but wanted it slightly larger and with more birch trees to lighten the quilt which I’ve shown in the second photo. Lastly, I created a third landscape quilt much smaller, Birch Trees 10 at the Lake (22.5″H x 28″W) which also focused on the awesome greens of spring and summer. I live in Pennsylvania where we have gentle hills (which we call mountains!) on the horizon which often find their way into my quilts. Summer colors are a blast of greens with the blues of a lake and the sky to soften the colors.